The right audio and visual set-up can transform an ordinary event into one that exceeds everyone’s expectations. From LED panels and projection mapping to lighting and speakers, EventAVision has all your event staging, audio and visual needs covered from start to finish. Let us transform your venue, whether it be a corporate meeting or full-fledged gala, into a display of light, sound and color that will leave a lasting impression on your guests. Tell us your vision and let us work our magic with sharp sound, high definition content and specialized AV technology. Today, audiovisual support is no longer simply a microphone and a flipchart. It now includes computer interfaces, high-definition imaging, rigging, power distribution, component video, event sound and lighting, plus all the traditional basic equipment. Our focus is on delivering innovative technology, combined with legendary customer service to ensure your satisfaction and that of your attendees. One of the most important elements for any event is the sound quality. It can make it or break it the audience experience and ultimately define the outcome of your event. To illustrate this affirmation think about it for a moment; when you are at a conference you are there to listen to the presenters, when you are at a concert, you are there to hear the music, when you are at a meeting, you want to hear and be heard. Regardless of the type of event, it’s the sound that gets your attention and keeps it, we often see first with our ears. At EventAVision you will receive the highest quality sound system ensure that every inch of your event receives the right audio coverage. In a world where high definition video is literally at your fingertips, no event is complete without quality multimedia support. Presentations will stand out when displayed on our high definition projectors or flat screen monitors, bringing your imagination to life. We offer an endless variety of video production services, including cameras and operators. From the highest quality sound systems to the latest visual technologies we can meet all your audio & visual needs. Vibrantly colored LED panels add an exciting visual element to any event and offer a brilliant way to highlight images. Whether your party is indoors or outdoors, these panels consistently deliver vivid images in any level of ambient light. No venue is too big or too small for a LED panel set-up. LED panels look just as detailed close-up as from a distance, allowing for a sharp experience regardless of proximity. We offer Absen High Defintition LED panels, available in many formats and also in custom configurations and sizes. 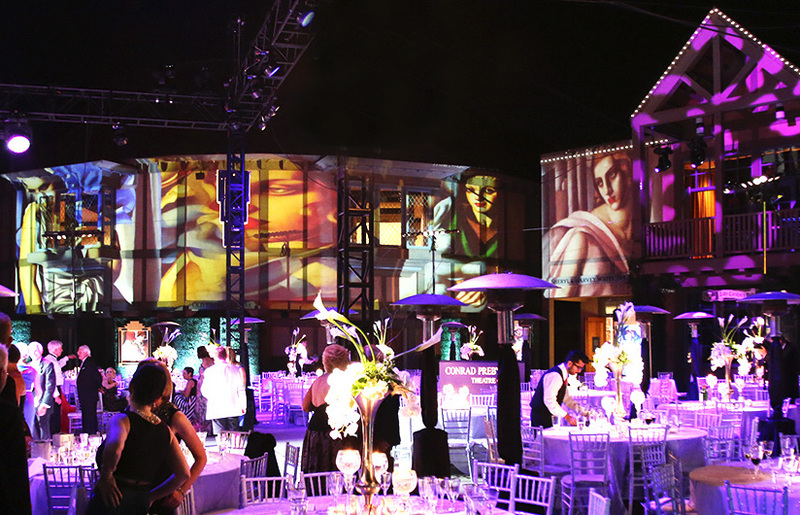 From superb performance to stunning brightness and high detailed images, these panels will enhance and add an imaginative element to your event making a lasting impact on your guests. Illuminate your event with a combination of impressive lighting technology, ranging from environmentally-friendly LED products to incredible large-scale projections. Simply use your imagination to create a spectacular visual display and we will use the latest lighting technology to make it come to life. By offering personalized attention, we are able to focus on both the small details and the big picture in order to ensure that all your creative dreams come true. Our ability to virtually paint an event using special lighting techniques that are designed to capture the mood, will surprise you. Think big and you will be on the right track for visualizing all that you can do with projection mapping. This innovative and exciting projection technique, also known as video mapping, can turn practically any surface, from a sculpture to the wall of a building, into a dynamic visual display. Thanks to specialized software and high definition projectors, we can transform the appearance of your event into anything you can envision. Amaze your guests with this spectacular, large-scale visual that can create magnificent 3-D art, amazing optical illusions or add the appearance of movement to stationary objects. The ways to use projection mapping are practically limitless!